Social media is abuzz after CNN labeled Ukrainian forces involved in Kiev’s deadly military operation in the country's southeast as “pro-US troops.” Online comments are calling it a Freudian slip, claiming it unmasks the true agenda behind the conflict. It was referring to the US president’s request to his team to consider the possibility of supplying lethal defense weapons to the Ukrainian government. The text scrolled for several minutes before and during CNN's Carol Costello interview with Lt. Col. James Reese on Monday morning. The definition of Kiev forces as “pro-US troops” looks to be a perfect contrast to the term “pro-Russian rebels,” which is used by Western media to refer to the militias in Ukraine’s southeastern Donetsk and Lugansk Regions. Western media outlets claim the regions are receiving direct support from Russia. Moscow has repeatedly stated that it is not part of the Ukraine conflict. Meanwhile, the US and EU have been unable to back their accusations that Russia is supporting and arming the rebels. Last week, Stephen Cohen, professor emeritus of Russian studies and politics at New York University and Princeton University, called the Ukraine conflict a proxy war between Russia and the US-led NATO bloc. “A political dispute in Ukraine became a Ukrainian civil war. 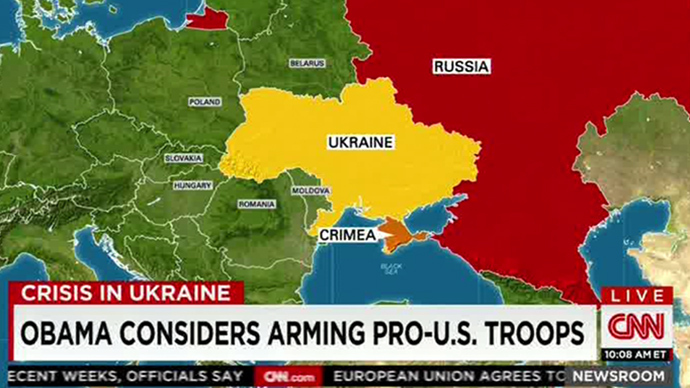 Russia backed one side; the United States and NATO, the other. So it’s not only a new Cold War, it’s a proxy war,” Cohen told Russia Insider. The Ukraine conflict began last April, when Kiev sent regular forces and volunteer battalions to the southeastern Donetsk and Lugansk regions, after rebels there refused to recognize the country’s new, coup-imposed authorities. The civil war has so far claimed the lives of 5,300 people, according to the UN.